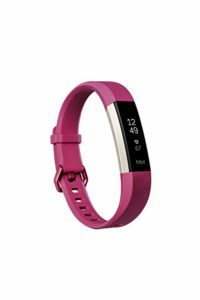 The Fitbit Alta HR tracks your steps. You can set a goal, of how many steps you take a day. To help you reach your daily goal, there are hourly notifications to remind you to move. You can also set customized alarms. Pure Pulse heart rate tracking. For resting and for showing real-time heart rate during your workouts. Tracks calories burned in a day. Measures your distance in miles or kilometers. You can set what hours in the day that you are active. And then it tracks your activity minutes. It prompts you to move if you’ve not reached your hourly goal. Auto sleep detection. Tracks your time spent in light, REM, or deep sleep. When you’re restless and awake. Other features are a clock display–with date & day, alarms–that you can set, auto exercise detection, text alerts, email alerts, and caller id. There is an online dashboard, by signing up with Fitbit. As well as an app that you can download and can connect with another exercise, fitness and dieting apps. I love my tracker. It is slimmer in design than my previous Fitbit. I was able to put on a leather band which I prefer over the silicon one that comes with it. It motivates me to reach my step goal. I was told by a trainer that when I’m working out, my heart rate should be 135. My Fitbit helps me to do just that, by watching my heart rate. I like the distance tracker, cause it totals my steps in miles. I feel more accomplished seeing my miles. My battery lasts about 6 days. And I have it set up where it vibrates when my battery is low. I also have it set, where I can see my battery level on my watches screen. You can set it up to wake you gently (vibrates) in the morning. Mine’s set at 9:00 AM. Later that evening, at 11:30 PM, it’ll vibrate, to remind me it’s time for bed. I also have reminders, that I programmed, reminding me to take my morning medicine at 10:00 AM, feed my baby Mojo (dog) @ 5:15 PM, & to remind me to take my evening meds @ 10:30 PM. I didn’t realize how much I relied on those reminders. I work from home, and I tend to get so absorbed in what I’m doing, that time just slips on by, but then I broke my Fitbit. I was so lost without it. I love my Fitbit!! You tap on your watch, to get all the readings that you’ve set up to be seen. I don’t have all options checked, just those that are important to me. I can see the time–with day and the date for that day. My steps, my mile distance, my real-time heart rate, my total calories burned, my resting heart rate, my battery level, and what time my next alarm will go off. For me, the only cons are that my Fitbit Alta HR is not waterproof. Not a real big issue for me, unless I’m going to the beach. Also, it would be nice if the vibration was a little more intense. I don’t always feel it when it goes off to wake me up in the morning. That is why I gave the rating 9 out of 10. (10 being the highest). All in all, I am satisfied with my Fitbit tracker. It was worth the money. I bought my husband the Fitbit Charger 2 HR, and he only takes it off to charge. It pushes him to reach his step goal and every day he smashes it every single day!!! If you’re looking for a fitness tracker I highly recommend this tracker. There are several models from which to choose from.